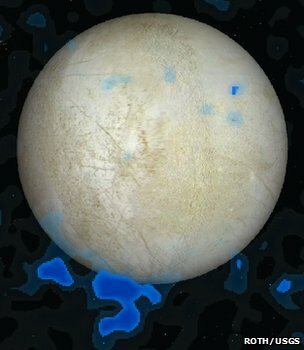 While it hasn’t been totally confirmed that the plumes on Europa’s surface are generating the water vapor Hubble detected, it certainly seems to be the most likely theory. Astronomers will work to confirm this theory, and if they do, Europa will be the second moon (after Saturn’s moon Enceladus) to feature water vapor plumes. The significance of the finding is two-fold: first, it would confirm the existence of the theorized water ocean that astronomers believe exists under the moon’s crust, and second, subsequent missions could access Europa’s goods, particularly to examine its chemical composition and candidacy for supporting life, without having to drill through the ice. “The plumes are incredibly exciting if they are there — they are bringing up material from the ocean. Perhaps there are organic molecules lying there on the surface of Europa,” says NASA planetary science chief James Green. Earlier this month, NASA also reported that Galileo’s near-infrared mapping spectrometer identified clay-like minerals on Europa’s surface. Astronomers believe that an impact(s) with a comet or asteroid may have brought the minerals to Jupiter’s moon. Such asteroids and comets often contain organic compounds, which lends further support to the theory that there may indeed be some kind of life there. NASA’s Juno probe is currently on its way to Jupiter and is scheduled to arrive at the solar system’s largest planet in July 2016. Hopefully, the probe will be able to gather information about Europa as well. The ESA’s Juice probe (JUpiter ICy moon Explorer) is scheduled to launch in 2022 and arrive at Jupiter in 2030. Europa is definitely on Juice’s agenda, as are the moons Ganymede and Callisto. Currently, Russian scientists are designing a probe that will hitch a ride on the Juice mission for a landing on Ganymede. If the scheduling coincides (i.e., if the Ganymede probe is ready), then the ESA is all about collaborating with Russia to get more information about Jupiter’s icy moons. Forget Mars, I say! The trip to Europa would only take about eight years. Think how good astronauts or colonists would get at playing “I Spy” during that amount of time!